Keeping a tractor engine idle for AC purposes or ensuring a cold start can become very pricey. Idling can lead to increasing fuel costs, engine stress and rising service costs due to engine maintenance. 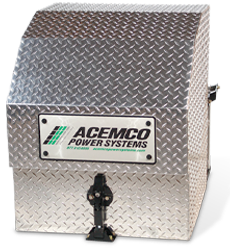 If you are looking for ways to reduce fuel consumption and a way to keep your drivers comfortable without the risk of anti-idle fines, then the ACEMCO Power Unit is your solution. Discretionary idling accounts for an average of 3,000 gallons of diesel a year on a typical sleeper truck. Diesel prices may vary, but this means installing an APU can result in savings of up to $10,000 a year. With the ACEMCO Auxiliary Power Unit (APU), you have the ability to turn off your engine and keep in-cab comfort level while reducing your operating costs. Safely protected in its weatherproof compartment on the side rails, the ACEMCO Auxiliary Power Unit (APU) runs off the truck’s fuel supply. Status Truck & Trailer Repair is an official dealer for ACEMCO Auxiliary Power Units.